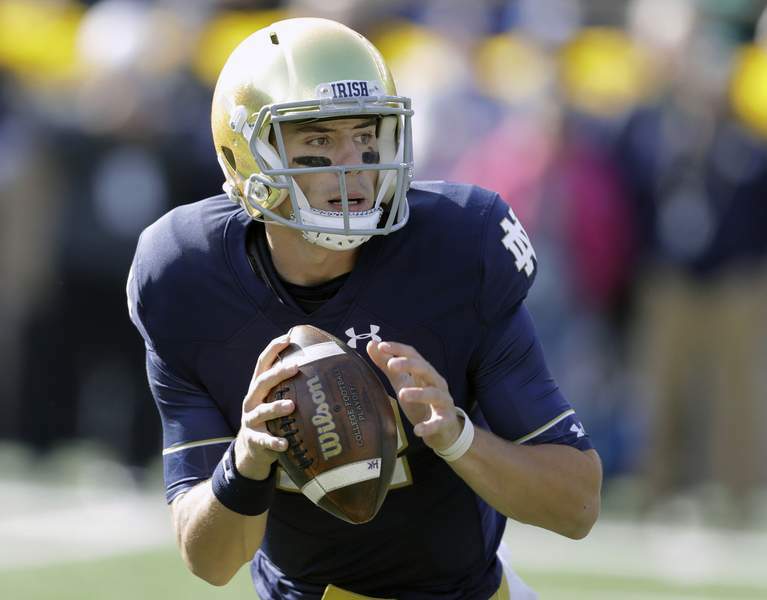 SOUTH BEND – The long summer offseason is upon Notre Dame. The 2019 Irish took the field at Notre Dame Stadium for the first time Saturday at the 90th Blue-Gold Game in front of an announced crowd of 30,074. In windy conditions, the defense racked up 15 sacks and scored the game's final 27 points to win 58-45, completing Notre Dame's spring football schedule after six weeks of workouts. Coach Brian Kelly downplayed the final score of the intrasquad scrimmage, preferring instead to focus on individual performances, from which there was plenty to learn. “Lot of people say, 'It's not a big deal about playing the spring game,' but it is a big deal,” Kelly said. “It gives you another measuring stick when you're evaluating individuals that haven't played a lot of football, and also those guys that are looking to take the next step for you to championship-level football. Some of the most impressive performances were on the defensive line, which got good push most of the afternoon and got after the quarterbacks in the red “no contact” jerseys. Khalid Kareem had three sacks, accomplished by putting two hands on the quarterback, and Jayson and Justin Ademilola added two each. Most of the sacks came against backup quarterback Phil Jurkovec, who struggled in the pocket. Kelly admitted that Jurkovec was probably trying too hard and expects the game to “be a lot simpler” for the freshman soon. Starter Ian Book, on the other hand, had a terrific game, going 16 for 21 for 220 yards and a 12-yard touchdown pass to wide receiver Michael Young. The wind made it difficult to throw deep, so Book relied on short and intermediate throws to move the ball down the field. Sophomore running back Jafar Armstrong had a terrific performance, breaking a game-best 42-yard run and totaling 163 yards in the air and on the ground. After the 2018 spring game, Kelly announced the appointment of offensive lineman Alex Bars as the team's fourth captain heading into the offseason. This season, no captains have been appointed, and the coach said he wants more to time to evaluate leadership in the offseason. The lack of clear leaders going into the summer is indicative of how many influential veterans departed after the 2018 season. Note: The Irish announced kickoff times for their home games this season. All games will start at 2:30 or 3:30 p.m. except the Oct. 12 matchup against USC, which will kick off at 7:30 p.m.